The Church of Scientology has a history of conflict with groups on the Internet. In 1995, attorneys for the Church of Scientology attempted to get the newsgroup alt.religion.scientology (a.r.s.) removed from Usenet. This attempt backfired and generated a significant amount of press for a.r.s. The conflict with a.r.s led the hacker group Cult of the Dead Cow to declare war on the Church of Scientology. The Church of Scientology mounted a 10-year legal campaign against Dutch writer Karin Spaink and several Internet service providers after Spaink and others posted documents alleged to be secret teachings of the organization. The Church of Scientology's efforts ended in a legal defeat in a Dutch court in 2005. This series of events is often referred to as "Scientology versus the Internet". Removal of the Tom Cruise Scientology video from YouTube prompted allegations that Scientology is censoring information about itself. On January 14, 2008, a video produced by the Church of Scientology featuring an interview with Tom Cruise was posted on YouTube. In the video, music from Cruise's Mission: Impossible films play in the background, and Cruise makes various statements, including saying that Scientologists are the only people who can help after a car accident, and that Scientologists are the authority on getting addicts off drugs. According to The Times, Cruise can be seen in the video "extolling the virtues of Scientology". Australian newspaper The Daily Telegraph characterized Cruise as "manic-looking" during the interview, "gush[ing] about his love for Scientology". The Church of Scientology asserted that the video material that had been leaked to YouTube and other websites was "pirated and edited" and taken from a three-hour video produced for members of Scientology. YouTube removed the Cruise video from their site under threat of litigation. The web site Gawker.com did not take down their copy of the Tom Cruise video, and other sites have posted the entire video. Lawyers for the Church of Scientology sent a letter to Gawker.com requesting the removal of the video, but Nick Denton of Gawker.com stated: "It's newsworthy and we will not be removing it." Project Chanology was formulated by users of the English-speaking imageboards 711chan.org and 4chan, the associated partyvan.info wiki, and several Internet Relay Chat channels, all part of a group collectively known as Anonymous, on January 16, 2008 after the Church of Scientology issued a copyright violation claim against YouTube for hosting material from the Cruise video. The effort against Scientology has also been referred to by group members as "Operation Chanology". A webpage called "Project Chanology", part of a larger wiki, is maintained by Anonymous and chronicles planned, ongoing and completed actions by project participants. The website includes a list of suggested guerrilla tactics to use against the Church of Scientology. Members use other websites as well to coordinate action, including Encyclopedia Dramatica and the social networking site Facebook, where two groups associated with the movement had 3,500 members as of February 4, 2008. A member of Anonymous told the Los Angeles Times that, as of February 4, 2008, the group consisted of "a loose confederation of about 9,000 people" who post anonymously on the Internet. A security analyst told The Age that the number of people participating anonymously in Project Chanology could number in the thousands: "You can't pin it on a person or a group of people. You've thousands of people engaged to do anything they can against Scientology." Members of Project Chanology say their main goal is "to enlighten the Church of Scientology (CoS) by any means necessary." Their website states: "This will be a game of mental warfare. It will require our talkers, not our hackers. It will require our dedicated Anon across the world to do their part." Project Chanology's stated goals include the complete removal of the Church of Scientology's presence from the Internet and to "save people from Scientology by reversing the brainwashing". Project Chanology participants plan to join the Church of Scientology posing as interested members in order to infiltrate the organization. Andrea Seabrook of National Public Radio's All Things Considered reported Anonymous was previously known for "technologically sophisticated pranks" such as spamming chat rooms online and "ordering dozens of pizzas for people they don't like". Ryan Singel of Wired appeared on the program on January 27, 2008, and told Seabrook that members of Anonymous were motivated by "the tactics the Church of Scientology uses to control information about itself" rather than the "controversial nature of Scientology itself". Project Chanology began its campaign by organizing and delivering a series of denial-of-service attacks against Scientology websites and flooding Scientology centers with prank calls and black faxes. The group was successful in taking down local and global Scientology websites intermittently from January 18, 2008 until at least January 25, 2008. Anonymous had early success rendering major Scientology websites inaccessible and leaking documents allegedly stolen from Scientology computers. This resulted in a large amount of coverage on social bookmarking websites. The denial-of-service attacks on Scientology.org flooded the site with 220 megabits of traffic, a mid-range attack. Speaking with SCMagazineUS.com, a security strategist for Top Layer Networks, Ken Pappas said that he thought that botnets were involved in the Anonymous operation: "There are circles out there where you could take ownership of the bot machines that are already owned and launch a simultaneous attack against [something] like the church from 50,000 PCs, all at the same time". In response to the attacks, on January 21, 2008 the Scientology.org site was moved to Prolexic Technologies, a company specializing in safeguarding web sites from denial-of-service attacks. Attacks against the site increased, and CNET News reported that "a major assault" took place at 6 p.m. EST on January 24, 2008. Anonymous escalated the attack on Scientology on January 25, 2008 and on January 25, 2008, the Church of Scientology's official website remained inaccessible. On January 21, 2008, Anonymous announced its goals and intentions via a video posted to YouTube entitled "Message to Scientology", and a press release declaring "War on Scientology", against both the Church of Scientology and the Religious Technology Center. In the press release, the group stated that the attacks against the Church of Scientology would continue in order to protect freedom of speech and to end what they characterized as the financial exploitation of church members. The Tom Cruise video is referred to specifically at the start of the Anonymous YouTube video posting, and is characterized as a "propaganda video". The video utilizes a synthesized voice and shows floating cloud images using a time lapse method as the speaker addresses the leaders of Scientology directly: "We shall proceed to expel you from the Internet and systematically dismantle the Church of Scientology in its present form..." The video goes on to state: "We recognize you as serious opponents, and do not expect our campaign to be completed in a short time frame. However, you will not prevail forever against the angry masses of the body politic. Your choice of methods, your hypocrisy, and the general artlessness of your organization have sounded its death knell. You have nowhere to hide because we are everywhere... We are Anonymous. We are Legion. We do not forgive. We do not forget. Expect us." By January 25, 2008, only four days after its release, the video had been viewed 800,000 times, and by February 8, 2008 had been viewed over 2 million times. Author Warren Ellis called the video "creepy in and of itself" and a "manifesto, declaration of war, sharp political film". In addition to DDoS attacks against Church of Scientology websites, Anonymous also organized a campaign on one of their websites to "begin bumping Digg", referring to an attempt to drive up Scientology-related links on the website Digg.com. On January 25, 2008, eight of the top ten stories on Digg.com were about either Scientology-related controversies or Anonymous and attempts to expose Scientology. Digg CEO Jay Adelson told PC World that Anonymous had not manipulated the site's algorithm system to prevent artificial poll results, stating: "They must have done a very good job of bringing in a diverse set of interests ... It just happened to hit a nerve that the Digg community was interested in." Adelson said two other instances which similarly have dominated the Digg main page in the past were the Virginia Tech Massacre in the aftermath of the incident and the "7/7" London bombings in 2005. Adelson commented on the popularity of Scientology theme within the Digg community: "In the history of Digg, there's no question that the topic of Scientology has been of great interest to the community ... I can't explain why." On January 29, 2008, Jason Lee Miller of WebProNews reported that a Google bomb technique had been used to make the Scientology.org main website the first result in a Google search for "dangerous cult". Miller wrote that Anonymous was behind the Google bomb, and that they had also tried to bump Scientology up as the first result in Google searches for "brainwashing cult", and to make the Xenu.net website first result in searches for "scientology". Rob Garner of MediaPost Publications wrote: "The Church of Scientology continues to be the target of a group called Anonymous, which is using Google bombs and YouTube as its tools of choice." In a February 4, 2008, article, Scientology spokeswoman Karin Pouw told the Los Angeles Times that Church of Scientology's websites "have been and are online." Danny McPherson, chief research officer at Arbor Networks, claimed 500 denial-of-service attacks had been observed on the Scientology site in the week prior to February 4, some of which were strong enough to bring the website down. Calling Anonymous a "motley crew of internet troublemakers", Wired blogger Ryan Singel said that, while attempting to bypass the Prolexic servers protecting the Church of Scientology website, users of a misconfigured DDoS tool inadvertently and briefly had targeted the Etty Hillesum Lyceum, a Dutch secondary school in Deventer. Another hacking group associated with the project, calling themselves the "g00ns", mistakenly targeted a 59-year-old man from Stockton, California. They posted his home telephone number, address and his wife's Social Security number online for other people to target. They believed that he was behind counter-attacks against Project Chanology-related websites by the Regime, a counter-hack group who crashed one of the Project Chanology planning websites. The group allegedly attempted to gain personal information on people involved in Project Chanology to turn that information over to the Church of Scientology. After discovering they had wrongly targeted the couple, one of the members of the g00ns group called and apologized. A new video entitled "Call to Action" appeared on YouTube on January 28, 2008, calling for protests outside Church of Scientology centers on February 10, 2008. As with the previous videos, the two-minute video used a synthesized computer voice and featured stock footage of clouds and sky. The video was accompanied by a text transcript with British English spelling. The video denied that the group was composed of "super hackers", stating: "Contrary to the assumptions of the media, Anonymous is not 'a group of super hackers.' ... Anonymous is everyone and everywhere. We have no leaders, no single entity directing us." The video said that Project Chanology participants include "individuals from all walks of life ... united by an awareness that someone must do the right thing." Specific controversies involving the CoS were cited in the video as the explanation for actions by Anonymous. In an email to CNET News, Anonymous stated that coordinated activities were planned for February 10, 2008, in many major cities around the world. Anonymous hoped to use "real world" protests to rally public opinion to their cause. According to the Associated Press, the protests were meant to draw attention to what the group refers to as a "vast money-making scheme under the guise of 'religion'". By January 30, 2008, 170 protests had been planned outside Church of Scientology centers worldwide. A video posted to YouTube called "Code of Conduct" outlined twenty-two rules to follow when protesting, and urged protestors to remain peaceful. On February 2, 2008, 150 people gathered outside a Church of Scientology center in Orlando, Florida to protest the organization's practices. Small protests were also held in Santa Barbara, California (during the Santa Barbara International Film Festival), and Manchester, England. Protesters in Orlando carried signs with messages "Knowledge is Free" and "Honk if you hate Scientology". According to WKMG-TV, the protesters called the Church of Scientology a "dangerous cult" and said the organization is responsible for crimes and deaths. The Orlando Sentinel reported that the protest was "part of a worldwide campaign by a group that calls itself Anonymous", and an unnamed organizer who spoke to the paper stated that the group was protesting "a gross violation of the right to see free church material", referring to the Tom Cruise video that was pulled from YouTube. Protesters at the demonstration wore masks, and said they were attempting to inform the public about what they believed to be "restrictions of free speech and profiteering through pyramid schemes" by the Church of Scientology. They asserted they were not protesting the doctrine of Scientology, but rather alleged actions of individual Scientologists. One protester stated that he had created a Facebook group to organize the protest, explaining "It started online with a group called Anonymous ... They got upset with Scientology because the church hides important documents that are supposed to be released to the public." On February 10, 2008, about 7,000 people protested in at least 100 cities worldwide. Within 24 hours of the first protest, a search for "Scientology" and "protest" on Google Blog Search returned more than 4,000 results and more than 2,000 pictures on the image-sharing site Flickr. Cities with turnouts of one hundred or more protesters included Adelaide, Melbourne, and Sydney, Australia; Toronto, Canada; London, England; Dublin, Ireland; and Austin, Dallas, Boston, Clearwater, and New York City, United States. 150 people protested at the Church of Scientology building in Sydney, Australia, carrying signs and wearing costumes. Participants were masked to maintain their anonymity and avoid possible retaliation from the Church of Scientology. Protesters chanted "Church on the left, cult on the right" (in reference to the Church that was beside the Church of Scientology building), "Religion is free" and "We want Xenu". Scientology staff locked down the building and set up a camera to record the event. After the protest in Sydney, a surge in online Internet traffic due to individuals attempting to view pictures from the protest crashed hundreds of websites when a server was overloaded. The Sydney protest was one of the first worldwide, and after the first images of the protest went online a surge in traffic drove the hosting company's bandwidth usage up by 900 percent. The hosting company Digitalis temporarily prevented access to hundreds of its clients' sites, and customer support representative Denis Kukic said the surge was unexpected: "We had no advance notice that there was going to be a sudden surge of traffic or that there would be more than 100 times the average traffic that this customer's website normally consumes." Masked protesters in Seattle, Washington, United States congregated in front of the Church of Scientology of Washington. Protesters were quoted as saying, "We believe in total freedom of belief. We have nothing against the people of Scientology, however the Church of Scientology has committed crimes. They're vehemently anti-opposition. Anyone who opposes them, must go down." A protester in Santa Barbara emphasized that their opposition was against the organization, not the belief system, and that they supported the Scientology split-off group known as the Free Zone. Protesters turned out in Pittsburgh, Pennsylvania despite unusually cold weather. The masked crowd consisted mainly of college students, including some who had travelled from as far as Penn State University. Protesters in Boston, Los Angeles, Pittsburgh, Toronto, Edinburgh, London, and other cities worldwide, wore Guy Fawkes masks modeled after the 2005 film V for Vendetta. (Guy Fawkes was an English Catholic executed for a 1605 attempt to destroy the House of Lords. In V for Vendetta, a rebel against a near-future fascist regime uses the mask in his public appearances and distributes many of its copies to the population to enable mass protests. The Boston Globe characterized usage of the Guy Fawkes masks as "an allusion to the British insurgent and a film depicting an antigovernment movement". Aaron Tavena of College Times wrote that the Guy Fawkes masks provided a "dramatic effect" to the protests, and Nick Jamison of The Retriever Weekly wrote: "During the February 10 protests, Anonymous was informative, Anonymous was peaceful, and Anonymous was effective. After seeing all of the pictures from the 10th with everyone in disguise, many sporting Guy Fawkes masks, I wanted to be a part of that." Scott Stewart of University of Nebraska at Omaha's The Gateway wrote: "Many participants sported Guy Fawkes masks to draw attention both to their identity as Anonymous and the Church of Scientology's abuse of litigation and coercion to suppress anti-Scientology viewpoints." The Internet meme Rickroll, where a link is given to a seemingly relevant website only to be directed to a music video of singer Rick Astley's pop single "Never Gonna Give You Up", has been used as a theme in the protests against Scientology. At February 10 protests in New York, Washington, D.C., London and Seattle, protesters played the song through boomboxes and shouted the phrase "Never gonna let you down! ", in what The Guardian called "a live rick-rolling of the Church of Scientology". In response to a website created by Scientologists showing an anti-Anonymous video, Project Chanology participants created a website with a similar domain name with a video displaying the music video to "Never Gonna Give You Up". In a March 2008 interview, Astley said that he found the rickrolling of Scientology to be "hilarious"; he also said that he will not try to capitalize on the rickroll phenomenon with a new recording or remix of his own, but that he'd be happy to have other artists remix it. Following the protests, there were reports that YouTube was freezing the view counts on videos criticizing Scientology, including clips from the protests themselves, potentially preventing them from being displayed on YouTube's front page. Similarly, the original "Message to Scientology" video had received nearly 2.5 million views and yet failed to be featured as a "most-watched". The net neutrality activist group movieLOL strongly criticized YouTube for a "display of the decay of internet freedom". YouTube's official response stated: "There was an issue with video view counts not increasing that has now been resolved. The correct number of views should be displayed in the next 24 hours. Thanks for your patience." Jonathan Holmes, the presenter of the Australian watchdog program Media Watch, reported on two cases of media censorship of the protests. News.com.au pixelated a poster carried by a protester which was revealed, through a Today Tonight segment, to have displayed the word "CULT". The Advertiser erased Tom Cruise's name from a protest placard, rendering the placard's message meaningless, without informing its readers. The Advertiser's editor, Melvin Mansell, stated that the alteration had "slipped by" and that he was opposed to the publication of doctored photographs. Note: Only protests in cities covered by reliable sources, such as news media, are included in this table. Any mentioned numbers correspond with the figures given in the cited sources; actual turnouts may have varied. This list may be incomplete. Revisions and additions cited with reliable and verifiable sources are welcome. To contribute, visit Template:Project Chanology protests, February 10, 2008 (talk). A protester in Brussels, Belgium reads from a prepared speech at the Brussels Stock Exchange on March 15, 2008. According to NBC11, a woman from Anonymous contacted them and stated that protests were planned against Scientology each month through May 2008; and that a large protest was planned for two days after Scientology founder L. Ron Hubbard's birthday, March 15. Carlos Moncada of The Tampa Tribune reported that an "open letter to the press from Anonymous" was sent out via e-mail, and states that a protest is planned for March 15, 2008. The e-mail refers to the Ides of March: "We, too, wish to celebrate this event, albeit in our own special way ... Beware the Ides of March, Church of Scientology!" The March protests were titled "Operation Party Hard". Protests began in Australia on March 15, 2008, and were followed by protests in major cities worldwide including Brussels, London, Seattle, Phoenix, Manchester, and Los Angeles. Approximately 7,000 to 8,000 people protested in about 100 cities worldwide. The protests took place in locations in Australia, Europe, Canada, and the United States. Approximately 200 masked protesters gathered outside the Church of Scientology's headquarters in Adelaide, Australia. An anonymous spokesman told News.com.au that Scientology should lose its tax-exempt status. About 150 protesters came to the Yonge Street headquarters of Scientology in Toronto, Canada; sang "Happy Birthday" and chanted "we want cake". During the Los Angeles protests, a plane flew overhead trailing a large sign that read "Honk if you think Scientology is a cult." 150 protesters demonstrated in Clearwater, Florida, and a local organizer for Anonymous told The Tampa Tribune, "We feel that we have an obligation to educate the public about the things that have gone on and hopefully make the Church of Scientology understand that they have to change." Two people were arrested by DeKalb County, Georgia police for using megaphones while stepping onto the surrounding street opposite of the church during a protest. The Atlanta Journal-Constitution reported that five protesters were cited for "causing 'hazardous' or 'offensive' conditions", and that eight motorists were pulled over by police and ticketed for excessive use of horns, after they honked while driving past the protest. The American Civil Liberties Union and Amnesty International are investigating the reaction of the police at the Atlanta protest. In contrast, a Los Angeles Police Department officer at the Los Angeles protest was widely praised after a video was uploaded to YouTube showing him acknowledging the demonstrators' right to protest and encouraging them to stay on the sidewalk for their own safety. This list may be incomplete. Revisions and additions cited with reliable and verifiable sources are welcome. To contribute, visit Template:Project Chanology protests, March 15, 2008 (talk). Anonymous held its third international protest against Scientology on April 12, 2008. Named "Operation Reconnect", the protest focused on increasing awareness of the Church of Scientology's disconnection policy. Protesters around the world gathered in over 50 cities, including Toronto, London, Sydney, and Berlin. A subsequent international protest was planned for May 10, 2008, according to The University Register it was titled "Operation Battletoad Earth", and an additional protest was planned for June 2008. According to John DeSio of The Village Voice, the May 10, 2008 protests were referred to as "Operation : Fair Game : Stop", and National Nine News has reported that the full title of the May 10 protests is "Battletoad Earth: Operation Fairgame Stop". The May 10 date was chosen as May 9 is the anniversary of Scientology founder L. Ron Hubbard's book Dianetics: The Modern Science of Mental Health. Over 400 people were present at the May 10, 2008 protests in cities in Australia. Wen Hsing, a member of Anonymous, commented to scopical.com.au about the Church of Scientology's denial of its "Fair Game" policy: "Even if the name 'fair game' is not in use, the Church of Scientology is an organisation that continues to practice a vicious policy of retribution against perceived enemies, and it teaches its members that extreme measures are morally justified if they aid the Church." This list may be incomplete. Revisions and additions cited with reliable and verifiable sources are welcome. To contribute, visit Template:Project Chanology protests, April 12, 2008 (talk). On May 10, a teenager who went to the protests in front of the Queen Victoria Street Church of Scientology in London was issued a court summons after being asked to take down a sign that read "Scientology is not a religion, it is a dangerous cult". Posting anonymously on a forum, the teenager stated "Within five minutes of arriving ... I was told by a member of the police that I was not allowed to use 'that word'". He said that the police told him he had 15 minutes to take down the sign. The teenager did not, citing a 1984 high Court ruling by Mr Justice Latey in which he described the Church of Scientology as a "cult" that was "corrupt, sinister and dangerous". The sign was then confiscated. Shami Chakrabarti, the director of Liberty, a human rights group, said that, "They will be banning words like 'war' and 'tax' from placards and demonstrations next. This is just barmy". On May 23, 2008, the legal action against the boy was dropped. A Crown Prosecution Service (CPS) spokesman said: "In consultation with the City of London Police, we were asked whether the sign was abusive or insulting. Our advice is that it is not abusive or insulting and there is no offensiveness (as opposed to criticism), neither in the idea expressed nor in the mode of expression." Anonymous also held a protest in Budapest, Hungary, in the same time and location as a program of the local Scientology church. Both New York and Boston protesters marching down Boston's Commonwealth Avenue on 11 October 2008. A protest was held June 14, 2008 titled "Sea Arrrgh" (a satirical reference to the Church of Scientology's Sea Org). Protesters dressed up as pirates. 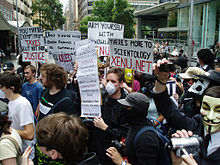 According to Macquarie National News, members of Anonymous highlighted the controversial practices of the Sea Org, including what the protesters believe to be forced contracts where Scientologists work below a livable wage, that female Sea Org members who become pregnant are pressured to have abortions, and that children of families in the organization are made to perform difficult physical labor. An international protest held on July 12, 2008 titled: "Spy vs. Sci" highlighted the Church of Scientology's Office of Special Affairs. A press release by the group posed the question: "Why does something that describes itself as a religion need an intelligence agency that aggressively persecutes critics?" The group posted a video in early August 2008 calling for renewed activity in their protest efforts, and planned a subsequent international protest for August 16, 2008. About 35 protesters gathered twice in September 2008 during the first preview and premiere of Arthur Miller's play All My Sons. They encouraged Scientologist Katie Holmes, wife of Tom Cruise, to leave the Church. The most recent international organized protest was held October 18, 2008. Members of Anonymous dressed as zombies, and highlighted what they described as questionable deaths and suicides of Scientologists. The film Valkyrie, starring and produced by Tom Cruise, premiered in New York City on December 17. Entertainment reporter Roger Friedman noted that it was held "in the private screening room at the Time Warner Center. Not the Ziegfield [sic] or Loews Lincoln Square, where most premieres are held in public." The venue was chosen in part to minimize the exposure to Scientology protestors gathered at the Time Warner Center. For the same reason, Cruise arrived at the December 18 Los Angeles screening through an underground tunnel. There were also Scientology protests at the European premiere in Berlin, where one protester got his V for Vendetta mask autographed by Tom Cruise. Chanology participants shared the limelight with a person in a bunny suit protesting against the hero worship of Claus von Stauffenberg. On January 8, 2009, an 18-year-old male member of Anonymous ran into the New York Scientology building shirtless and covered with Vaseline, pubic hair, and toenail clippings. He then proceeded to toss books around and smear the mixture on objects in the building. The man, identified by police as Mahoud Samed Almahadin, was charged with burglary, criminal mischief, and aggravated harassment as hate crimes. Two weeks later, 21-year-old film student and Anonymous member Jacob Speregen was charged with aggravated harassment and criminal mischief as hate crimes after he filmed Almahadin carrying out his prank. According to his mother and the video, Speregen was filming the event from behind the barricade. Scientology critics Mark Bunker and Jason Beghe disagreed with the individual's actions. Anonymous protester demonstrating during January 2009 raid outside the Founding Church of Scientology in Washington, D.C. Anonymous organized a 12th global protest against Scientology for January 10, 2009, to coincide with the Chanology movement's first anniversary. On February 10, 2009, Anonymous released a statement: "Scientology operatives still continue to paint Anonymous in a negative light as a means of distracting attention from Scientology operations and attempting to discredit those who bring truth to the issues at hand. It just isn’t working." The group claimed credit for leaks of internal Scientology documents that appeared on the website WikiLeaks, and announced further global protests for subsequent weekends in February 2009. Members of Anonymous continued to celebrate the one-year anniversary of the Chanology movement during February 2009, with protests held in locations including Hemet, California. On March 3, 2009, the Board of Supervisors in Riverside County, California, voted to approve an ordinance which restricts residential picketing there to 30 ft (9.1 m) or further from an individual's residence. The ordinance was originally introduced by Supervisor Jeff Stone, board chairman, in November 2008, and went through multiple changes. Critics of the ordinance stated that Stone proposed the measure due to favor for Scientology, which has its Hemet compound located in Riverside County. "The whole ordinance is tainted. The reasons behind it are tainted," said county resident Lirra Bishop. Stone stated the measure was intended for all residents of the county, though he cited protests at Scientology's Gold Base facility which houses residences and Scientology's Golden Era Productions as an example of why the ordinance is needed. Protesters at Gold Base have included members of Anonymous, and Scientology officials claimed they were "threatened with violence". Protesters told the Board of Supervisors that due to the lack of sidewalk near Gold Base, the anti-picketing ordinance would severely hamper the ability to protest outside the Scientology compound. After stating on October 17, 2008, that he would plead guilty to involvement in the January 2008 DDoS attacks against Church of Scientology websites, an 18-year-old self-described member of Anonymous entered a guilty plea related to hacking charges in May 2009. A release from the US Justice Department said that the individual, a resident of New Jersey, "participated in the attack because he considered himself a member of an underground group called 'Anonymous'". Thom Mrozek, a spokesman for the Justice Department, said that the Church of Scientology had cooperated in the investigation. The individual faces a sentencing scheduled for August 2009. In May 2009, members of Anonymous told WSMV-TV that they were bullied by off-duty security guards while protesting at a Scientology event in April in Nashville, Tennessee. According to WSMV-TV, a protester stated he was assaulted by three Scientology security guards while on public property, 400 yd (370 m) away from the Scientology building. The Church of Scientology had previously informed the security guards that the protesters were "dangerous people". A protester was issued three citations by the Scientology security guards, but these were all dismissed by the district attorney. On May 8, 2009, WSMV-TV reported that "laws appear to have been broken" in the manner in which the Scientology security guards handled the protesters. The Scientology security guards were not clearly identified as off-duty police officers, and permits for the Scientology event attended by the Anonymous protesters were for the wrong day. "The armed people from the other county are not identified police officers. You're looking for a problem", said John M. L. Brown, a Fraternal Order of Police attorney. In November 2009, the New York Post interviewed former Scientologist Mandy Mullen, who had joined the Manhattan organization in 2008 after seeing information on 4chan about Chanology protests. Over the next year, she recalled cases of members being coerced into donating more and more money. When she told her "leader" that she had looked at websites run by anti-Scientology protesters (and disagreed with them), he reportedly replied "That's like saying I don't burn niggers, I just like to party with the KKK!" In Fall 2008 Mullen left the church, joining a group of Chanology protesters across the street. Church of Scientology Manhattan President John Carmichael issued a response the following week, stating "Mandy Mullen's story about Scientology... is all lies in the service of Anonymous, a hate group that targets our Church, or even anyone who just falls onto their radar." On November 13, 2009, Independent Australian Senator Nick Xenophon used parliamentary privilege to accuse the Church of Scientology of being a criminal organisation. A woman who stated she was a member of Anonymous told KNTV that the group has shifted strategy to activities which fight Scientology but are not deemed illegal by the United States government, including an attempt to get the Internal Revenue Service to investigate the Church of Scientology's 501(c)(3) tax-exempt status. Another woman from Anonymous told Newsweek that the group plans to accomplish this through a lobbying campaign. United States tax authorities removed the Church of Scientology's tax-exemption status in 1967, stating that the organization's auditing techniques served as a for-profit operation for L. Ron Hubbard. In 1984, the United States Tax Court ruled that the Church of Scientology was guilty of "manufacturing and falsifying records to present to the IRS, burglarizing IRS offices and stealing government documents, and subverting government processes for unlawful purposes." The Church of Scientology's tax-exempt status in the United States was reinstated in 1993. A member of Anonymous calling herself "Envie" told Today Tonight that the group has longer term plans against the Church of Scientology: "We are incredibly determined ... There are those of us who have been talking about plans for the next 12 to 18 months." A member of Anonymous calling herself "Sarah" spoke with Radar magazine about a letter-writing campaign: "We're sending letters to senators and congresspeople requesting that their tax-exempt status be looked at." In a January 25, 2008 statement made to News.com.au, a spokesman for the Church of Scientology said, "These types of people have got some wrong information about us." A Toronto, Canada spokesperson for the Church of Scientology said she didn't "give a damn" if the group Anonymous was responsible for disrupting access to the Scientology site. Church spokeswoman Yvette Shank told Sun Media that she thought the Anonymous members were a "pathetic" group of "computer geeks". On January 26, 2008, CNET News reported that Karin Pouw, public affairs director for the Church of Scientology, did not address their specific request for a comment about the denial-of-service attacks but instead only responded to the appearance of the Tom Cruise video on YouTube. Pouw stated that the video consisted of "pirated and edited" excerpts of Cruise from a 2004 Scientology event, and that after the video appeared, there was increased traffic to Scientology sites as shown by top lists compiled by search engines. Pouw went on to state "Those wishing to find out the Church of Scientology's views and to gain context of the video have the right to search official Church Web sites if they so desire." On January 28, 2008, Radar Online reported that the Church of Scientology asked the U.S. Attorney General's office in Los Angeles, the Federal Bureau of Investigation, and the Los Angeles Police Department to start a criminal investigation of possible criminal activity related to the DDoS attacks. An unnamed source told Radar that the Church of Scientology argued to law enforcement that the Internet attacks are a form of "illegal interference with business." Radar also reported that in statements to law enforcement the Church of Scientology emphasized its status as a religious organization in the United States in order to assert that the DDoS attacks can be classed as hate crimes. The day after the Church of Scientology complained to law enforcement about the DDoS attacks, one of the main Project Chanology sites was down, and a message on the site said that their site crashed due to attacks from Scientologists. In a statement issued to Wikinews, a Church of Scientology employee confirmed that actions of Anonymous had been reported to law enforcement: "Activities of Anonymous have been reported to the Authorities and actions are being taken. Their activities are illegal and we do not approve of them. At the same time, our main work is to improve the environment, make people more able and spiritually aware. ... yes, we are taking action." The Church of Scientology issued a statement explaining the website move to Prolexic Technologies: "The attacks have defaced and rendered inoperable a number of CoS web sites. But as a very wealthy institution, the Church has fought back with technological answers. On January 21, the Church of Scientology moved its domain to Prolexic Technologies, a group that specializes in protecting Web sites from [denial of service] attacks by creating a safe tunnel by filtering all incoming mail and then allowing only clean messages through." Lee Sheldon of the Church of Scientology of Orlando and Lee Holzinger of the Church of Scientology of Santa Barbara issued similar statements regarding the February 2, 2008 protests in Florida and California, respectively. Sheldon stated "we recognize the right to legal protest", and Holzinger said "People have the right to express themselves ... The Church of Scientology has always defended the right of freedom of expression." Both representatives also expressed concerns regarding the spread of "hate speech". The Church of Scientology released a statement regarding the February 10, 2008 worldwide protests, which was published February 7, 2008 in the St. Petersburg Times. In the statement, the Church of Scientology called the organizers of the protests "cyberterrorists", and stated: "We take this seriously because of the nature of the threats this group has made publicly. We will take every step necessary to protect our parishioners and staff as well as members of the community, in coordination with the local authorities." The statement also referred to the actions of members of Project Chanology as "hate crimes" and "religious bigotry", and in a media release said that the group is guided by Communist Manifesto and Mein Kampf; one of the organizers of the protest responded to the latter allegation by stating: "I don't know where they got that from, but I don't think that's true considering that I am a capitalist and a Jew". Pat Harney, spokeswoman for the Church of Scientology in Clearwater, Florida told the St. Petersburg Times: "We are dealing with a worldwide threat ... This is not a light matter." In preparation for the February 10, 2008 protests outside Scientology's spiritual headquarters in Clearwater, the Church of Scientology spent $4,500 to hire ten off-duty police officers for security. Clearwater Police Department spokeswoman Elizabeth Daly-Watts stated that the off-duty police officers will make sure that protesters do not trespass on Scientology property or violate the law, but will report to police supervisors and not representatives of the Church of Scientology. The Church of Scientology posted a YouTube video claiming that Anonymous are "terrorists" and alleging that Anonymous is perpetrating "hate crimes" against the church. The video does not provide any evidence supporting their claims, and the FBI has not named any suspects for several of the threats mentioned. Anonymous has denied involvement in the more severe accusations. The church also released a DVD containing the YouTube video. The DVD called Anonymous a "dangerous" group and accused them of making threats against Scientology. Men claiming to be from the law firm Latham and Watkins delivered the DVD to family members of at least one person who protested. YouTube user "AnonymousFacts", which Radar Online described as an associate of Scientology, displayed the names and personal information of several supposed Anonymous members and accused the group of violent threats and terrorism. YouTube quickly took the video down and suspended the "AnonymousFacts" account. The Church of Scientology sought an injunction and a restraining order to prevent Anonymous from protesting on March 15, 2008, citing threats allegedly made by Anonymous. Both the injunction and the restraining order were denied. On March 31, 2008, Radar Online reported that representatives of law firms delivered legal letters to suspected Anons, often at their homes. The Church filed complaints of trespassing and criminal harassment against Boston organizer Gregg Housh, who was charged with disturbing an assembly of worship, disturbing the peace, and harassment. The District Attorney's office dropped the harassment charge, and Judge Thomas Horgan issued a continuance without finding for the remaining charges. In a May 8, 2008 appearance on CNN, Church of Scientology spokesman Thomas W. Davis said that Scientology was "dealing with ninety-six death threats, bomb threats, acts of violence, vandalism" from the group Anonymous. CNN's John Roberts responded, stating that the Federal Bureau of Investigation found nothing connecting Anonymous to the Church of Scientology's accusations of violence: "You are leveling these accusations at this group, the F.B.I., which is looking into it, says it has found nothing to connect this group Anonymous with what you're talking about, or death threats against members of the church, the F.B.I. at this point says - it has no reason to believe that charges would be leveled against this group." In a YouTube video, Mark Bunker asked Anonymous to stop using destructive tactics. Andreas Heldal-Lund, founder of the Scientology-critical website and non-profit organization Operation Clambake, released a statement criticizing the digital assault against Scientology. Heldal-Lund commented, "People should be able to have easy access to both sides and make up their own opinions. Freedom of speech means we need to allow all to speak – including those we strongly disagree with. I am of the opinion that the Church of Scientology is a criminal organisation and a cult which is designed by its delusional founder to abuse people. I am still committed to fight for their right to speak their opinion." He also stated that "Attacking Scientology like that will just make them play the religious persecution card ... They will use it to defend their own counter actions when they try to shatter criticism and crush critics without mercy." Mark Bunker, an Emmy Award-winning journalist and Scientology critic who runs the website XenuTV.com, posted a video to YouTube and asked Anonymous to tone down their campaign against the Church of Scientology. According to NPR's Morning Edition, Bunker has "become a revered voice to many members of Anonymous", and they refer to him as "Wise Beard Man". Bunker told Newsweek that he was pleased to see a large group of young individuals acting against Scientology, but stated he was also concerned for their safety: "I know the way Scientology works: they're going to get these people in trouble ... I'm very concerned about their safety, and I'm concerned about the Scientologists' safety, too." Bunker stated that he has received 6,000 emails from individuals who say they are part of Anonymous. Bunker attended the February 10, 2008 protest against Scientology in Los Angeles. Tory Christman, a critic of Scientology and former Scientologist from 1969 to 2000, stated she disapproved of illegal tactics but felt encouraged by the new influx of critics of Scientology. Christman told Morning Edition: "It feels like we've been out in this desert, fighting this group one-on-one by ourselves, and all of a sudden this huge army came up with not only tons of people, thousands of people, but better tools..." Scientology critic Arnaldo Lerma told the St. Petersburg Times he was impressed by a video of a protest against Scientology which took place in Orlando, Florida: "I've never seen anything like that before. This is incredible. I wouldn't have believed it if I didn't see it on a Web cam." In a February 4, 2008 appearance on the G4 television program Attack of the Show!, Mark Ebner, journalist and author of the book Hollywood, Interrupted, and Nick Douglas of Gawker.com commented on Project Chanology. Ebner stated that "Hacking their site is not really the best way to go about taking them (the Church of Scientology) down. Most critics you talk to want the Scientology site to be up there so that people who are interested can see the stupidity they have on the web and at the same time they can go – they are a few keystrokes from getting a thousand other opinions." Nick Douglas explained that the group decided to shift their strategy away from the attacks to Scientology websites: "Anonymous even decided that they were going to stop that attack, that it was a bad idea. It's the usual thing they used to do when they really hadn't had a thought out plan, and here they're realizing they actually have to figure out some real plan against a real enemy." University of Alberta professor Stephen A. Kent weighed in on the issue, and said "I think these disruptions probably are illegal. At the very least, they’re forms of harassment ... We now have three parties involved. Anonymous, Scientology and law enforcement." Kent stated that "The hacker community has been angry at Scientology for (their) attempts to block free speech on the Internet." Reaction to the denial of service attack on the Church of Scientology websites was mixed in message board forums for PC World. Some readers praised the actions of Anonymous, while others commented that the DDoS attacks bring more attention to Scientology. The Economist likened the DDoS attacks used by Project Chanology to "cyberwarfare techniques normally associated with extortionists, spies and terrorists", and referred to Anonymous as "internet activists". Dan Schultz of PBS's MediaShift Idea Lab commented that the movement "is a really fascinating case study of how current technologies and information dissemination via digital media can snowball into something that actually results in real world action". In a follow-up piece, Schultz discussed the tools used by digital media to achieve community impact, including lower barriers to entry and greater efficiencies through the use of information systems. Schultz wrote "For members of Anonymous I'm betting most of these things are already unspoken understandings", and pointed to their use of memes and cited the forums of the website enturbulation.org as an example of the group's ability to collaborate effectively to accomplish goals. In a May 8, 2008 report on the recent actions of Anonymous against Scientology, CNN reporter Kareen Wynter commented: "Legal experts say the church may be facing its biggest challenge yet – trying to protect its image, in a loosely policed medium seen by millions of people. In a July 2008 interview with Entertainment Weekly, Alan Moore had this to say about the use of the Guy Fawkes motif, adopted from his comic V for Vendetta: "I was also quite heartened the other day when watching the news to see that there were demonstrations outside the Scientology headquarters over here, and that they suddenly flashed to a clip showing all these demonstrators wearing V for Vendetta [Guy Fawkes] masks. That pleased me. That gave me a warm little glow." ^ a b c Landers, Chris (January 25, 2008). "The Internets Are Going to War". Baltimore City Paper. Retrieved 2008-01-25. ^ a b c Schliebs, Mark (January 25, 2008). "Internet group declares war on Scientology". news.com.au. News Limited. Retrieved 2008-01-25. ^ a b c d e f g h Thomas, Nicki (January 25, 2008). "Scientology and the internet: Internet hackers attack the church". Edmonton Sun. ^ a b c d e f McMillan, Robert (January 25, 2008). "Hackers Hit Scientology With Online Attack: Hacker group claims to have knocked the Church of Scientology's Web site offline with a distributed denial-of-service attack". PC World. IDG. IDG News Service. Retrieved 2008-01-25. ^ a b c d e f g h i j Braiker, Brian (February 8, 2008). "The Passion of 'Anonymous': A shadowy, loose-knit consortium of activists and hackers called 'Anonymous' is just the latest thorn in Scientology's side". Newsweek. pp. Technology: Newsweek Web Exclusive. Retrieved 2008-02-09. ^ a b c d O'Connell, Kelly (IBLS Editor) (January 30, 2008). "INTERNET LAW - Hackers Disable Scientology Website & Declare War". Internet Business Law Services. Internet Business Law Services, Inc. Retrieved 2008-01-31. ^ a b c d e Barkham, Patrick (February 4, 2008). "Hackers declare war on Scientologists amid claims of heavy-handed Cruise control". The Guardian. Retrieved 2008-02-03. ^ a b c d Cook, John (March 17, 2008). "Scientology - Cult Friction: After an embarrassing string of high-profile defection and leaked videos, Scientology is under attack from a faceless cabal of online activists. Has America's most controversial religion finally met its match?". Radar Online. Radar Magazine. Archived from the original on 7 January 2009. ^ a b Warne, Dan (January 24, 2008). ""Anonymous" threatens to "dismantle" Church of Scientology via internet". APC Magazine. National Nine News. Archived from the original on September 21, 2012. Retrieved 2008-01-25. ^ a b KNBC Staff (January 24, 2008). "Hacker Group Declares War On Scientology: Group Upset Over Church's Handling Of Tom Cruise Video". KNBC. Retrieved 2008-01-25. ^ a b Richards, Johnathan (The Times) (January 25, 2008). "Hackers Declare War on Scientology: A shadowy Internet group has succeeded in taking down a Scientology Web site after effectively declaring war on the church and calling for it to be destroyed". Fox News. Archived from the original on 2011-05-10. Retrieved 2008-01-25. ^ The Daily Telegraph staff; Agence France-Presse (January 16, 2008). "Tom Cruise scientology video leaked on the internet: We've always known Tom Cruise is a bit looney, but his latest scientology propaganda video leaked on the internet crosses the line into the downright creepy". The Daily Telegraph. Archived from the original on 18 March 2009. ^ Fox News staff (January 23, 2008). "Report: Church of Scientology Slams German Tabloid for Publishing Comments Comparing Tom Cruise to Nazi Minister". Fox News. Archived from the original on 2009-06-05. Retrieved 2008-01-25. ^ a b c Vamosi, Robert (January 24, 2008). "Anonymous hackers take on the Church of Scientology". CNET News. Retrieved 2008-01-25. ^ New Zealand Herald staff (January 19, 2008). "Video shows Cruise in rave mode". New Zealand Herald. APN Holdings NZ Limited. Retrieved 2008-01-25. ^ a b George-Cosh, David (January 25, 2008). "Online group declares war on Scientology". National Post. Archived from the original on January 28, 2008. Retrieved 2008-01-25. ^ a b Singel, Ryan (January 23, 2008). "War Breaks Out Between Hackers and Scientology -- There Can Be Only One". Wired. Retrieved 2008-01-25. ^ Feran, Tom (January 24, 2008). "Where to find the Tom Cruise Scientology videos online, if they're still posted". The Plain Dealer. Retrieved 2008-01-25. ^ a b Chan Enterprises (January 21, 2008). "Internet Group Declares "War on Scientology": "Anonymous" are fighting the Church of Scientology and the Religious Technology Center" (PDF). Press Release. PRLog.Org. Retrieved 2008-01-25. ^ a b c Brandon, Mikhail (January 28, 2008). "Scientology in the Crosshairs". The Emory Wheel. Emory University. Archived from the original on 2012-05-15. Retrieved 2008-01-31. ^ a b c d e Vamosi, Robert (25 January 2008). "Anonymous steps up its war with Scientology". CNET News. Retrieved 2008-01-25. ^ Davies, Shaun (2008-05-08). "Critics point finger at satirical website". National Nine News. Archived from the original on 2012-04-08. ^ a b c d Puzzanghera, Jim (February 4, 2008). "Scientology feud with its critics takes to Internet: Cyber attacks and threats against the church erupt after it asks YouTube to pull Tom Cruise clips". Los Angeles Times. Retrieved 2008-02-05. ^ Shanahan, Leo (February 7, 2008). "Hackers declare Scientology D-day". The Age. Retrieved 2008-02-07. ^ Ashwal, Dharmendra (AHN News Writer) (January 30, 2008). "Anonymous Hackers Attack Church Of Scientology Website". All Headline News. AHN Media Corp. Retrieved 2008-01-31. ^ a b Seabrook, Andrea (January 27, 2008). "Hackers Target Scientology Web Sites: Their problem isn't with the religion, they say, but their insistence on controlling information". All Things Considered. NPR. Retrieved 2008-01-28. ^ a b c Kaplan, Dan (January 25, 2008). "DDoS hack attack continues against Church of Scientology". SCMagazineUS.com. Haymarket Media. Archived from the original on January 29, 2008. Retrieved 2008-01-26. ^ a b c Vamosi, Robert (January 25, 2008). "Technical aspects of the DDoS attacks upon the Church of Scientology". CNET News. Retrieved 2008-01-25. ^ United Press International (January 25, 2008). "Hackers target Scientology". United Press International. UPI.com. Retrieved 2008-01-25. ^ Perez, Jesse (January 28, 2008). "Video: Mysterious group threatens to destroy Church Of Scientology". LIVENEWS.com.au. Macquarie National News. Retrieved 2008-01-28. ^ a b c d e f Abel, Jonathan (February 8, 2008). "New foe emerges against Scientology: The youth-oriented group has organized protests, including one in downtown Clearwater". St. Petersburg Times. Retrieved 2008-02-08. ^ Ellis, Warren (2007-01-22). "We are your SPs". Warrenellis.com. Retrieved 2008-01-28. ^ a b c McMillan, Robert (January 26, 2008). "Hackers Hit Scientology With Online Attack - UPDATE: Campaign accelerates from distributed denial-of-service attack to Digg bumps". PC World. IDG News Service). Retrieved 2008-01-28. ^ Miller, Jason Lee (January 29, 2008). "Scientology Bomb Cruises Past Google". WebProNews: Breaking eBusiness and Search News. iEntry, Inc. Archived from the original on February 1, 2008. Retrieved 2008-01-29. ^ Miller, Jason Lee (January 31, 2008). "Confirmed: Crusaders Google Bomb Scientology". WebProNews: Breaking eBusiness and Search News. iEntry, Inc. Archived from the original on February 1, 2008. Retrieved 2008-01-31. ^ Garner, Rob (January 30, 2008). "Google Bombing And SEM Is Evolving Into 'Search Engine Activism'". MediaPost Publications. MediaPost Communications. Archived from the original on February 14, 2007. Retrieved 2008-01-30. ^ Singel, Ryan (January 25, 2008). "Anonymous Hackers Shoot For Scientologists, Hit Dutch School Kids". Wired. Retrieved 2008-01-27. ^ Etty Hillesum Lyceum (November 12, 2007). "Etty Hillesum Lyceum in Deventer". Website's Main Page. Archived from the original on 2008-01-16. Retrieved 2008-01-27. ^ Singel, Ryan (2008-01-29). "Anonymous Hackers Track Saboteur, Find and Punish the Wrong Guy". Wired. Retrieved 2008-01-29. ^ a b "Scientology Internet Hackers Plan Real-Life Protests at Church Locations". Fox News. Associated Press. January 31, 2008. Retrieved 2008-01-31. ^ a b c d Feran, Tom (January 31, 2008). "The group Anonymous calls for protests outside Scientology centers". The Plain Dealer. Retrieved 2008-02-04. ^ a b c d Vamosi, Robert (January 28, 2008). "Anonymous names February 10 as its day of action against Scientology". CNET News. Retrieved 2008-01-28. ^ a b Staff (January 31, 2008). "Fair game: An online onslaught against Scientology". The Economist. Retrieved 2008-01-31. ^ Edds, Kimberly (January 30, 2008). "UPDATE: Powder mailed to 19 Scientology centers: FBI investigating synchronized threats mailed to Southern California properties, including Tustin and Newport Beach locations". The Orange County Register. Retrieved 2008-01-31. ^ Dahdah, Howard (February 8, 2008). "'Anonymous' group declares online war on Scientology: 'Anonymous' looks to YouTube as it ratchets up its protest against Scientologists". Computerworld: The Voice of IT Management. IDG Communications. Archived from the original on February 13, 2008. Retrieved 2008-02-08. ^ a b c d e Staff (February 3, 2008). "Group Lines Road To Protest Church Of Scientology". WKMG-TV. Internet Broadcasting Systems and Local6.com. Archived from the original on 2008-03-28. Retrieved 2008-02-03. ^ a b c Eckinger, Helen; Gabrielle Finley; Katherine Norris (February 3, 2008). "Anti-Scientology group has protest rally". Orlando Sentinel. Archived from the original on February 6, 2008. Retrieved February 3, 2008. ^ a b c d e f g Standifer, Tom (February 4, 2008). "Masked Demonstrators Protest Against Church of Scientology". Daily Nexus. University of California, Santa Barbara. pp. Issue 69, Volume 88. ^ Eber, Hailey (February 4, 2008). "Anti-Scientologists Warm Up for February 10". Radar Online. Retrieved 2008-02-04. ^ a b c Moncada, Carlos (2008-02-12). "Organizers Tout Scientology Protest, Plan Another". tbo.com/. The Tampa Tribune. Retrieved 2008-02-13. ^ a b c d e Andrew Ramadge (2008-02-14). "Scientology protest surge crashes websites". News.com.au. News Limited. ^ Pengelley, Jill (2008-02-10). "Anonymous protesters picket Scientology". The Advertiser. News Limited. ^ Andrew Ramadge (2008-02-11). "Scientology 'raids' held in nearly 100 cities". News.com.au. News Limited. Archived from the original on 2008-02-11. Retrieved 2008-02-12. ^ a b c d Andrew Ramadge (10 February 2008). "Scientology protests start across Australia". News.com.au. News Limited. Retrieved 2008-02-10. ^ CTV.ca News Staff (2008-02-10). "Demonstrations held against Scientology". CTV Television Network. Retrieved 2008-02-12. ^ Staff reporter (11 February 2008). "Scientology protest drama". The Sun. Retrieved 2008-02-12. ^ a b Greenwald, Will (11 February 2008). "Anonymous Attacks!". CNET News.com. Retrieved 2008-02-12. ^ "Protesters picket Dublin office of scientology church". The Irish Times. 11 February 2008. Retrieved 2008-02-12. ^ "Scientology Protest" (newscast). KXAN-TV. 10 February 2008. ^ Debbie Denmon (2008-02-11). "Scientology protestors focus on Dallas woman's death". News 8. WFAA-TV. Archived from the original (includes newscast) on 2008-02-12. Retrieved 2008-02-13. ^ James O'Brien (11 February 2008). "Masked group protests to 'dissolve' Church of Scientology". bostonnow.com. Retrieved 2008-02-13. ^ a b Poltilove, Josh (2008-02-11). "Internet-Based Group Pickets Scientology". TBO.com. The Tampa Tribune. Archived from the original on 2008-02-14. Retrieved 2008-02-13. ^ a b KING staff (2008-02-10). "Seattle group stages protest against Church of Scientology". king5.com/. Seattle. Archived from the original on 2008-02-12. Retrieved 2008-02-11. ^ Meagher], Chris (14 February 2008). "Scientology Church Decries Wave of Worldwide Persecution". Santa Barbara Independent. Retrieved 2008-02-26. ^ a b Sherman, Jerome L. (11 February 2008). "Masked protesters target Scientology's 'tactics'". Pittsburgh Post-Gazette. Retrieved 2008-02-12. ^ a b c d Forrester, John S. (2008-02-11). "Dozens of masked protesters blast Scientology church". The Boston Globe. Retrieved 2008-02-12. ^ Sarno, David (2008-02-11). "L.A. takes part in Scientology protests". Los Angeles Times. ^ Clarkson, Brett. "200 cruise by Scientology HQ". Toronto Sun. ^ Bonokoski, Mark (2008-02-12). "Passing of Hubbard has mellowed Scientology". CANOE. Toronto Sun. Archived from the original on 2013-01-15. Retrieved 2008-02-25. ^ Stewart-Robertson, Tristan (11 February 2008). "Masked protesters hike up pressure on Scientologists". The Scotsman. Retrieved 2008-02-13. ^ Black, Tim (11 February 2008). "Who's afraid of the Church of Scientology?". Spiked Online. Spiked. Retrieved 25 February 2008. ^ Shermer, Michael (25 February 2008). "Scientology: a leap beyond faith". Regina Leader-Post. Archived from the original on 4 June 2009. Retrieved 2008-02-25. ^ Tavena, Aaron (2008-02-14). "Anonymous' E-War against Scientology is ... kind of cute?". Daily Buzz. College Times. Archived from the original on 2013-01-21. Retrieved 2008-02-25. ^ Jamison, Nick (19 February 2008). "Hello Scientologists, we are Anonymous". The Retriever Weekly. University of Maryland. p. Front Page. Retrieved 2008-02-25. ^ a b Stewart, Scott (March 25, 2008). "Cyberterrorism, hacktivism: Trying to find hope: Anonymous fights Co$ while Chinese launch cyber attacks on human rights groups". The Gateway. University of Nebraska at Omaha. Archived from the original on March 29, 2008. Retrieved 2008-03-25. ^ Saunders, Terri (February 11, 2008). "A real song and dance at church: Entertaining protest fails to amuse Ottawa Scientologists". Ottawa Sun. ^ Kendrick, Mike (March 13, 2008). "Cultura Obscura: Rickrolling". The Gateway. University of Alberta. Retrieved 2008-03-20. ^ a b Michaels, Sean (March 19, 2008). "Taking the Rick: Twenty years after Never Gonna Give You Up, Rick Astley became an internet phenomenon - and an unlikely weapon against Scientology". The Guardian. Retrieved 2008-03-20. ^ Sarno, David (March 25, 2008). "Web Scout exclusive! Rick Astley, king of the 'Rickroll,' talks about his song's second coming". Los Angeles Times. Web Scout. ^ Andy, Sternberg (March 25, 2008). "Rick Astley Calls Rickroll 'Hilarious,' 'Bizarre'; Plans Arena Tour, But Can He Still Dance?". LAist. Gothamist LLC. Archived from the original on March 30, 2008. Retrieved 2008-03-26. ^ a b movieLOL (2008-02-12). "YouTube found blocking nearly all anti-Scientology content from its 'Videos' front page". Retrieved 2008-03-13. ^ Holmes, Jonathan (25 February 2008). "Tom Cruise goes Missing" (video and transcript). Media Watch. Australian Broadcasting Corporation. Retrieved 2008-03-13. ^ a b NBC11 Staff (February 5, 2008). "Anonymous: 300,000 People To Protest Scientology Sunday". NBC11. KNTV. Retrieved 2008-02-05. ^ a b DeSio, John (6 May 2008). "Queens Anonymous Member Gets a Letter from Scientologists". Runnin' Scared. The Village Voice. Archived from the original on 10 May 2008. Retrieved 2008-05-06. ^ a b Staff (March 16, 2008). "Worldwide Scientology protests mark founder's birthday". Scopical News/Data. Scopical Pty Ltd. Archived from the original on 2008-03-19. Retrieved 2008-03-16. ^ Ferrell, David (March 17, 2008). ""Anonymous" vs. Scientology: Group Targets "Church" Headquarters: Growing movement of Internet pranksters hits the organization's heart in Hollywood". LA Weekly, LP. Archived from the original on March 20, 2008. Retrieved 2008-03-21. ^ Ramadge, Andrew (2008-03-17). "Second round of Anonymous v Scientology". News.com.au. News Limited. Archived from the original on 2009-10-06. Retrieved 2008-03-17. ^ a b Ramadge, Andrew (20 March 2008). "Scientology site gets a facelift after protests". News.com.au. News Limited. Archived from the original on 20 March 2008. Retrieved 2008-03-20. ^ Jason Buckland (16 March 2008). "Rally 'targets' Scientology". Toronto Sun. Archived from the original on 19 March 2008. Retrieved 2008-03-16. ^ Nankervis, David (15 March 2008). "More protests against Scientology". News.com.au. News Limited. ^ Buckland, Jason (March 16, 2008). "Rally 'targets' Scientology: Masked protesters use Hubbard birthday to march on T.O. offices". Toronto Sun. Archived from the original on March 19, 2008. Retrieved 2008-03-16. ^ Ferrell, David (March 17, 2008). ""Anonymous" vs. Scientology: Group Targets "Church" Headquarters". LA Weekly. Archived from the original on March 22, 2008. Retrieved 2008-03-20. ^ a b Moncada, Carlos (March 16, 2008). "Protesters Picket Scientology Again". The Tampa Tribune. Archived from the original on March 20, 2008. Retrieved 2008-03-16. ^ Simpson, David (17 March 2008). "DeKalb Police arrest five for weekend protest in Dunwoody". The Atlanta Journal-Constitution. Retrieved 2008-03-17. ^ Okurley, Graeme (March 26, 2008). "Down with Scientology! Wait, can we really say that? : Anonymous takes to the streets". The Manitoban Online. 95 (25). University of Manitoba. ^ Uranga, Rachel (2008-03-25). "Web site lets users rate their local cops -- good and bad". Los Angeles Daily News. Archived from the original on 2008-03-27. Retrieved 2008-03-26. ^ Davies, Shaun (March 20, 2008). "Scientology strikes back in information war". National Nine News. ninemsn. Retrieved 2008-03-20. ^ a b Cawley, Donavon (April 17, 2008). "The Internet versus Scientology". The University Register. University of Minnesota Morris. Retrieved 2008-04-18. ^ Murray, Oliver (April 12, 2008). "Masked protesters rally against Scientology". CTV News. CTV.ca. Retrieved 2008-04-13. ^ "Masken-Demonstration gegen Psycho-Sekte". Bild. April 14, 2008. Archived from the original on February 17, 2009. Retrieved 2008-04-14. ^ Davies, Shaun (8 May 2008). "The internet pranksters who started a war: They've become the sworn enemies of a controversial religion, famous for unsettling online video attacks and protesting en masse in creepy masks". National Nine News. news.ninemsn.com.au. Archived from the original on 12 July 2012. Retrieved 2008-05-08. ^ Howd, Jason (May 10, 2008). "S for Scientology: Masked Protesters at Portland Church of Scientology". Willamette Week. Archived from the original on May 13, 2008. Retrieved 2008-05-12. ^ Moncada, Carlos (2008-05-07). "Internet Group Schedules Another Protest Of Scientology". The Tampa Tribune. tbo.com. Archived from the original on June 4, 2009. Retrieved 2008-05-07. ^ a b Staff (May 12, 2008). "Hundreds attend Australia-wide Scientology protests". Scopical News. Scopical Pty Ltd. Archived from the original on May 13, 2008. Retrieved 2008-05-11. ^ a b Bingham, John (2008-05-21). "Boy faces court for Scientology placard - A teenage boy is facing a possible criminal prosecution for holding a sign describing the Church of Scientology as a "cult", police said on Tuesday". The Daily Telegraph. Retrieved 2008-05-23. ^ Dawar, Anil (2008-05-20). "Teenager faces prosecution for calling Scientology 'cult'". The Guardian. Retrieved 2008-05-23. ^ "No charges over Scientology demo - Legal action has been dropped against a 15-year-old who faced prosecution for branding Scientology a "cult"". BBC News. 2008-05-23. Retrieved 2008-05-23. ^ "Tüntetés a szcientológus szekta ellen holnap Zuglóban!" (in Hungarian). 2008-05-24. Retrieved 2008-05-25. ^ Donila, Mike (2008-05-14). "Clearwater merchants upset over anti-Scientology protests". St. Petersburg Times. Archived from the original on 2008-05-18. Retrieved 14 May 2008. ^ Shah, Neel (5 June 2008). "Xenuphobia: Anonymous Takes to the High Seas in Latest Protest". Radar. Archived from the original on 7 June 2008. Retrieved 2008-06-05. ^ Perez, Jesse (June 6, 2008). "Anonymous wages pirate war against Church Of Scientology". Macquarie National News. Macquarie Radio Network Limited. Archived from the original on June 7, 2008. Retrieved 2008-06-06. ^ Shah, Neel (30 June 2008). "Anonymous Set to Protest Scientology, Again". Radar. Archived from the original on 14 July 2008. Retrieved 2008-07-24. ^ Staff (2008-06-30). "Anti-Scientology group on attack". New York Daily News. Retrieved 2008-07-24. ^ Leyden, John (August 4, 2008). "Anonymous relaunches fight against Scientology". The Register. Retrieved 2008-10-16. ^ Staff (2008-07-24). "'Anonymous' plans mass Scientology protest". The Daily Telegraph. ^ Coyle, Jake (October 17, 2008). "Katie Holmes and 'All My Sons' debuts on Broadway". Associated Press. ^ Faraone, Chris (October 15, 2008). "Battling Scientology". The Boston Phoenix. The Phoenix Media/Communications Group. Retrieved 2008-10-16. ^ Roger Friedman (15 December 2008). "Cruise 'Feeble' in Valkyrie". Fox 411. FoxNews.com. Retrieved 2008-12-16. ^ Hazlett, Courtney (2008-12-15). "Group bungles protest at 'Valkyrie' premiere". MSNBC. Retrieved 2008-12-16. ^ a b Hall, Alan (19 December 2008). "Slender Tom Cruise takes to the red carpet for premiere.... but anti-Scientology protesters steal the show again". Mail Online. Retrieved 28 December 2008. ^ a b c "Anonymous vs. Scientology: Tom Cruise signiert Maske". Heise Online (in German). Heinz Heise. 21 January 2008. Retrieved 21 January 2008. ^ a b Punkt 9 (in German). RTL Television. 21 January 2008. Event occurs at 0:11:06-0:12:53. ^ a b Burke, Kerry (15 January 2009). "Greasy vandal in hate crime vs. Scientology". New York Daily News. Retrieved 1 March 2009. ^ a b Burke, Kelly; Simone Weischelbaum (28 January 2009). "Man who filmed petroleum jelly-covered Scientology protester's rampage arrested as accessory". New York Daily News. Archived from the original on January 31, 2009. Retrieved 1 March 2009. ^ Ortega, Tony (January 16, 2009). "Wise Beard Man to Anonymous: Don't be a Dope". Runnin' Scared. Village Voice. Archived from the original on February 19, 2009. Retrieved 2009-03-01. ^ Ortega, Tony (January 15, 2009). "Jason Beghe to Anonymous: Grow Up". Runnin' Scared. Village Voice. Archived from the original on February 19, 2009. Retrieved 2009-03-01. ^ Leyden, John (January 6, 2009). "Anonymous celebrates first anniversary of Scientology protests: Still plugging away". The Register. Retrieved 2009-05-23. ^ a b Leyden, John (February 10, 2009). "Anonymous digs ahead of more assaults on Scientology". The Register. Retrieved 2009-05-23. ^ Tsotsis, Alexia (February 5, 2009). "My Date With Anonymous: A Rare Interview With the Elusive Internet Troublemakers". LA Weekly. Retrieved 2009-05-23. ^ a b c d e f g Young, Paul (March 4, 2009). "Board restricts pickets to 30 feet from property". The Desert Sun. p. B9. ^ Staff (October 17, 2008). "Teenage hacker admits Scientology cyber-attack". Agence France-Presse. Archived from the original on October 21, 2008. Retrieved 2008-10-18. ^ a b c d Sarno, David (May 11, 2009). "'Anonymous' Hacker Pleads Guilty to Attack on Scientology Sites". Los Angeles Times. LATWP News Service. ^ a b c Ferrier, Dennis (May 7, 2009). "Protesters Say They Were Bullied By Police: Scientology Protestor Says He Was Arrested For No Reason". WSMV-TV. wsmv.com. Archived from the original on May 10, 2009. Retrieved 2009-05-23. ^ WSMV-TV staff (May 13, 2009). "Citations Dropped In Scientology Scuffle: College Student Says Officers Attacked Him". WSMV-TV. wsmv.com. Archived from the original on May 17, 2009. Retrieved 2009-05-23. ^ a b c Ferrier, Dennis (May 8, 2009). "Scientology Security Permits Not Valid: Permits Valid Day Before Event Occurred; Officers Not Clearly Identified". WSMV-TV. wsmv.com. Archived from the original on May 11, 2009. Retrieved 2009-05-23. ^ Karni, Annie (November 15, 2009) "Weird 'Science': Why I Left the Church of Scientology - The 100-pound Parasite off my Back", The New York Post. Postscript 29. ^ Carmichael, John (November 22, 2009) Scientology Rebuts The New York Post. Accessed 2009-11-22. ^ "Scientology's Dark Secrets". The Age. 2009-11-21. Retrieved 2011-11-27. ^ "The Two Faces of Scientology". The Age. 2009-11-20. Retrieved 2011-11-27. ^ Seymour, Brian (February 7, 2008). "The Anonymous war on Scientology: The Church of Scientology is already banned in several countries but now it is facing one of its biggest threats from a group called Anonymous". Today Tonight. Yahoo! News. Retrieved 2008-02-09. ^ a b Vamosi, Robert (January 26, 2008). "Church of Scientology responds to Internet attacks". CNET News. Retrieved 2008-01-26. ^ Shah, Neel (January 28, 2008). "Radar Exclusive: Scientologists Bring in Fed Big Boys to Squash Internet Attacks". Radar Online. Radar Magazine. Archived from the original on January 30, 2008. Retrieved 2008-01-29. ^ Shah, Neel (January 29, 2008). "The Scientology Counterattack". Radar Online. Radar Magazine. Archived from the original on January 31, 2008. Retrieved 2008-01-31. ^ Staff (February 4, 2008). "Hackers wage web war on Scientologists". The Daily Telegraph. Archived from the original on February 5, 2008. Retrieved 2008-02-04. ^ Ashwal, Dharmendra (Celebrity News Service News Writer) (January 30, 2008). "Hackers Launch Cyber War Against Church Of Scientology". All Headline News. AHN Media Corp. Archived from the original on June 4, 2009. Retrieved 2008-01-30. ^ a b c Times Staff (Released statement from Church of Scientology) (February 7, 2008). "Church of Scientology responds to protest plans: The organizers of the event are cyberterrorists, the church says". St. Petersburg Times. St. Petersburg Times. Retrieved 2008-02-08. ^ a b Staff (March 13, 2008). "Scientology goes after Anonymous on YouTube - UPDATE: A Church of Scientology spokeswoman has confirmed the video was produced and posted by the Church". Los Angeles Times. Web Scout. Archived from the original on March 17, 2008. Retrieved 2008-03-28. ^ Shah, Neel (March 14, 2008). "Xenuphobia: Scientologists Rip Page From 'Anonymous' Playbook". Radar Online. Radar Magazine. Archived from the original on March 17, 2008. Retrieved 2008-03-28. ^ Johnson, Richard (March 15, 2008). "Tom's Church Counterattacks". New York Post. NYP Holdings, Inc. Archived from the original on March 27, 2008. Retrieved 2008-03-28. ^ a b c d Gray, Tyler (March 26, 2008). "Xenuphobia: 'Anonymous' Kid Outed by Scientologists Gets House Call". Radar Online. Radar Magazine. Archived from the original on March 27, 2008. Retrieved 2008-03-28. ^ Staff (March 15, 2008). "Protests again target Church of Scientology". MyFox Tampa Bay. Fox Television Stations, Inc. Retrieved 2008-03-28. ^ Farley, Robert (March 13, 2008). "Judge denies petition by Scientologists to limit protest: The church filed a suit for an "injunction for protection" from a group called Anonymous". St. Petersburg Times. Retrieved 2008-03-28. ^ Leyden, John (March 17, 2008). "Scientologists fight back against Anonymous: But fails to get injunction". The Register. Retrieved 2008-03-28. ^ Ramadge, Andrew (March 18, 2008). "Second round of Anonymous v Scientology". News.com.au. News Limited. Archived from the original on October 6, 2009. Retrieved 2008-03-28. ^ Gray, Tyler (March 31, 2008). "Xenuphobia: Anonymous on Trial? Scientology Steps Up Skirmish". Radar Magazine. Radar Magazine. Archived from the original on April 5, 2008. Retrieved 2008-03-31. ^ a b Faraone, Chris (October 23, 2008). "Battling Scientology". The Phoenix. Retrieved 2008-11-02. ^ a b Paulson, Michael (October 22, 2008). "Scientology protester must stay away". The Boston Globe. Retrieved 2008-11-02. ^ a b c d Masters, Kim; Renée Montagne (February 7, 2008). "'Anonymous Wages Attack on Scientologists: The fight started when the Scientologists tried to get a video of Tom Cruise off the Internet". Morning Edition: Digital Culture. National Public Radio. Retrieved 2008-02-07. ^ Heldal-Lund, Andreas (January 22, 2008). "OC Press Release 22 January 2008: DDoS attacks on Scientology". Press Release. Operation Clambake. Retrieved 2008-01-25. ^ Whyte, Murray (February 10, 2008). "Scientology Protests – Anons plan `polite' church protest: Demonstrations – sparked by viral spread of Tom Cruise promo video – planned in 14 countries". Toronto Star. Retrieved 2008-03-21. ^ David Sarno (2008-02-10). "'Anonymous' takes anti-Scientology to the streets". Los Angeles Times. Web Scout. Archived from the original on February 12, 2008. Retrieved 2008-02-13. ^ a b c EMorton (February 4, 2008). "The Loop: Anonymous V. Scientology". Attack of the Show!. G4. Retrieved 2008-02-06. ^ a b Parker, Kellie (January 31, 2008). "Of Web Site Attacks and High-Def Formats: What do Scientology and high-def movie formats have in common? Controversy, as readers prove in our forums". PC World. Retrieved 2008-01-31. ^ Schultz, Dan (February 15, 2008). "Anonymous vs. Scientology: A Case Study of Digital Media". MediaShift Idea Lab: Reinventing Community News for the Digital Age. PBS. Retrieved 2008-02-15. ^ a b Schultz, Dan (February 15, 2008). "Community Organization with Digital Tools". MediaShift Idea Lab: Reinventing Community News for the Digital Age. PBS. Retrieved 2008-03-03. ^ Wynter, Kareen (May 8, 2008). "Attacking Scientology: The Church of Scientology faces a new breed of Internet attacks. Kareen Wynter reports". CNN. Retrieved 2008-05-08. ^ Gopalan, Nisha (July 16, 2008). "Comic-Con Q&A: Alan Moore Still Knows the Score! - Watchmen, his upcoming projects, South Park, shaving his beard -- the relatively reclusive comics author talks about all that and more in a wide-ranging chat". Entertainment Weekly. Retrieved 2009-03-01. Wikimedia Commons has media related to Demonstrations and protests by Anonymous against Scientology. "Message to Scientology", "Anonymous", YouTube, January 21, 2008. "Call to Action", "Anonymous", YouTube, January 27, 2008. "Code of Conduct", "Anonymous", YouTube, February 1, 2008. "The Road to February 10, 2008", "Anonymous", Dailymotion, February 14, 2008. High quality compilation video of the Feb 10 protests and what led up to them. "Onward - the road to March 15, 2008, "Anonymous", Vimeo, March 26, 2008. "Scientology Declares Victory Over Anonymous"